Accelerated reader-- Your child has a zone. This zone is by book level. They can only take a quiz within that zone. So if your student tries to take a quiz and it won't let them, it is most likely because the book in not within their zone. It is set for 2.5-5.0 for book levels. Smarter Balanced Testing April 1, 3, 8, 10, 15 and 17 or until completed! ​~~ We are going to try to test on Mondays and Wednesdays in April. -- Noon release on April 18 to kick off Easter Break. **Students will be expected to restate this skill each month! 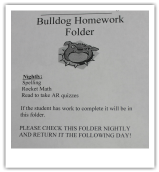 Homework folders These are to be brought back and forth to school daily. ​work during the day, it will be sent home for completion. and read for AR quizzes EVERY NIGHT!